Goodreads Summary: Will Scarlet is on the run. Once the sheltered son of nobility, Will has become an exile. While his father, Lord Shackley, has been on the Crusades with King Richard, a treacherous plot to unseat Richard has swept across England, and Shackley House has fallen. Will flees the only home he’s ever known into neighboring Sherwood Forest, where he joins the elusive gang of bandits known as the Merry Men. Among them are Gilbert, their cruel leader; a giant named John Little; a drunkard named Rob; and Much, an orphan girl disguised as a bandit boy. This is the story of how a band of misfit outlaws become heroes of legend – thanks to one brave 13-year-old boy. Will In Scarlet is such a cool book! I really liked it, and it’s a great take on how Robin Hood became Robin Hood. We all know the story of Robin Hood, and while I never thought about how Robin Hood came to be, I thought Cody did a great job at showing one such take on the Robin Hood story. I’m super-fuzzy on the whole Robin Hood tale, and only remember the basic story, so I actually had to do a quick refresher on Robin Hood. I liked that Will In Scarlet focused on Will, and what it was like for him to go from being part of the nobility to being a bandit. I honestly didn’t remember Will, and was interested in Will as a character. I liked that when he fled the castle he lived in, he saw what things were really like, and Will being sheltered was pretty obvious because he seemed pretty surprised by what was out there. I also liked that Will decided to stay in England even though he had the chance to go to France and be with his mom and her family until things got sorted out. I liked the historical backdrop of the book, and Cody did a great job of showing what things were like while also making seem interesting and even a bit fun at times. There’s a lot of action, and I couldn’t wait to find out what happened next. You learn things throughout the book, and all of the details make the book come to life. I don’t know anything about the time period in which the book is set, but I loved the feel of the book, and the very vague recollection I have of this period seems accurate. The historical details are explained really well, especially since they relate so much to what is going on with Will and at Shackley Castle. I think this would be a great book for required reading, and I also think it’s a book a lot of teens would like. I think it’s better suited for the younger end of the YA spectrum, since middle grade-ish, but I also think it’s something people of all ages would enjoy too, especially if you like Robin Hood re-tellings. I really liked Will In Scarlet! It’s a great take on the Robin Hood story, and I like that it focuses on how Robin Hood became Robin Hood through the eyes of Will Scarlet. 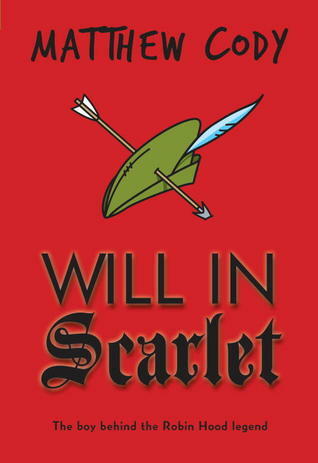 Will In Scarlet gets 4 stars.